I saw this today and it struck a nerve. 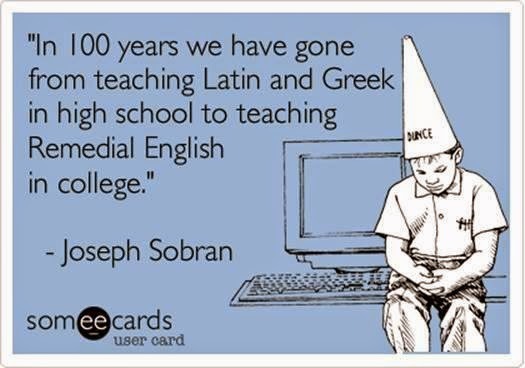 As a teacher of those remedial college courses and someone who spends a lot of time reading about educational history, I feel the need to point out a few facts that this image doesn't quite capture. Yes, 100 years ago the high school curriculum looked a lot different from today's, but curriculum wasn't the only crucial difference. In 1900, only about 1/3 of the population received a high school diploma. Those rates are now around 90%. In 1900, more than 10% of the United States population was illiterate. By 1979, that rate had been reduced to less than 1%. Even more important is looking at those stats based on who was allowed access to education. Taking those same years, we can see that in 1900, 44.5% of black people in America were illiterate; by 1979, that had been reduced to 1.6%. When someone laments the state of contemporary education by nostalgically looking back at some long ago golden era of learning in America, what they're really saying--whether they are aware of it or not--is that they want to go back to a time when education was limited to an elite few, the few who were guaranteed to pass the standards of acceptability because those standards had been specifically designed with their class and race's cultural norms in mind. If you want to go back 100 years in education, we're talking about erasing desegregation efforts, eliminating career options for women, denying children of poor families a shot at high school, and generally ignoring the role of equal opportunity in educational spaces. As I recently wrote about at length, the history of expanding education to those who were once denied it can be traced through philosophical differences in the history of Harvard and Yale. When Harvard made the then-radical decision to allow access based on entrance exams rather than on family status, they allowed a trickle through what would later become a floodgate. It was a move toward making educational opportunities more meritorious and less aristocratic, and it would lay the groundwork for the educational equality movements of the 1960's and 1970's. In many ways, it informs the discussions we're having about education today, right at this moment. When we talk about "remedial" English classes, we must remember that English 101 (what we now consider "standard") was once remedial as well. Every time that we have opened up education to a group of people who were previously excluded, we lament the "dumbing down" of our standards. What we're really looking at is a threat to the carefully maintained borders of a hegemonic playing field. The standards of 100 years ago were standards based in exclusion and elitism, the residual effects of which still linger in our classrooms today. We have made great strides toward making education a democratic process, but we still have many strides to make. Romanticizing the exclusionary past in a fog of nostalgia clouds our ability to make those moves. YES!! I don't know how often people are confused by the school failure mythos that clouds public thinking about education and collective performance. It reminds me of this article about the misuse of SAT data within the "Nation at Risk" report. Anyway, great note and I look forward to reading through your blog! to produce your current rural children education rate.